December 8, 2017 By Elizabeth Lindemann 4 Comments / This post may contain affiliate links. 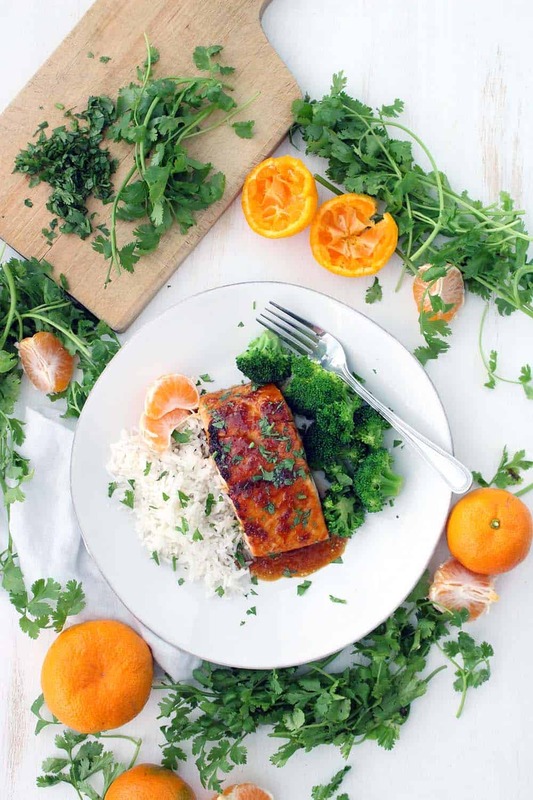 I’m in LOVE with this colorful – and healthy – Mandarin Orange Glazed Salmon. It was a welcome reprise this week from the seemingly never-ending piles of cookies and cakes that abound during the holidays. 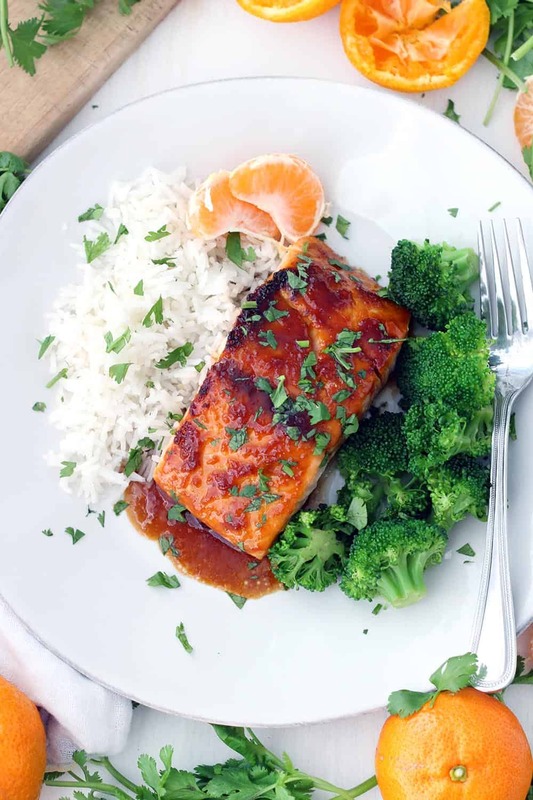 Light, flavor-packed, perfectly broiled and flaky salmon with a thick, sticky, sweet and salty orange flavored glaze on top, served with steamed broccoli and rice? Yes, please! This recipe only takes 15 minutes to make, start to finish. And the broiling/glazing method I used results in the most perfectly cooked salmon ever- it stays super moist and flakes perfectly. I’ve also included an optional step to ensure the salmon skin gets crispy- as with chicken, I love to eat crispy salmon skin. It has a deep flavor and is very nutritious– it’s packed with a high concentration of Omega-3 fatty acids. Searing it in a hot skillet before adding it to the baking sheet to broil will ensure it’s crispy and delicious, rather than soft and rubbery. I’m just all about Mandarin oranges this week! We have a satsuma orange tree that we planted in the spring, and it’s produced tons of fruit this fall. After making this Spicy Gingerbread Cake with Orange Mascarpone Cream (YUM), I wanted to try a more savory approach to cooking with the small, juicy satsumas. You can use any kind of Mandarin orange you want for this recipe- I almost always have some in my fridge during this time of year, when they are so sweet and delicious. Not to mention, they are a wonderful dose of vitamin C during flu season! Alternatively, you can use 1/2 of a larger orange. The glaze is a mixture of the zest and juice from a Mandarin orange, brown sugar, garlic, ginger, sriracha hot sauce, soy sauce, and rice wine vinegar. You probably already have most of those things in your pantry or fridge. Usually, I try and stick to natural sweeteners, such as honey or maple syrup. But when it comes to making a thick glaze, regular sugar works best, since it caramelizes and thickens a bit better. Feel free to substitute the brown sugar with honey, or even molasses, if you prefer. This is one of those difficult blog posts to write, because I keep looking at the photos and being sad that I don’t have any more of the deliciousness pictured in them. I fully plan on making this again next week, and the next, and the next… I don’t think I’ll be able to stop! This is definitely my new favorite way to prepare salmon, especially using the broiling method outlined in the recipe below. Love salmon? Try this seared salmon with scallion butter, or this garlic poached salmon with creamy lemon caper sauce. Both are fast and easy to make, since salmon takes almost no time to cook, making it the perfect healthy weeknight protein! Budget-friendly tip: if you see wild-caught salmon on sale, buy a bunch of it and freeze it. It’s not a cheap fish, but you can make up for the cost by buying it on sale and serving it with inexpensive sides, such as simple steamed broccoli and rice. 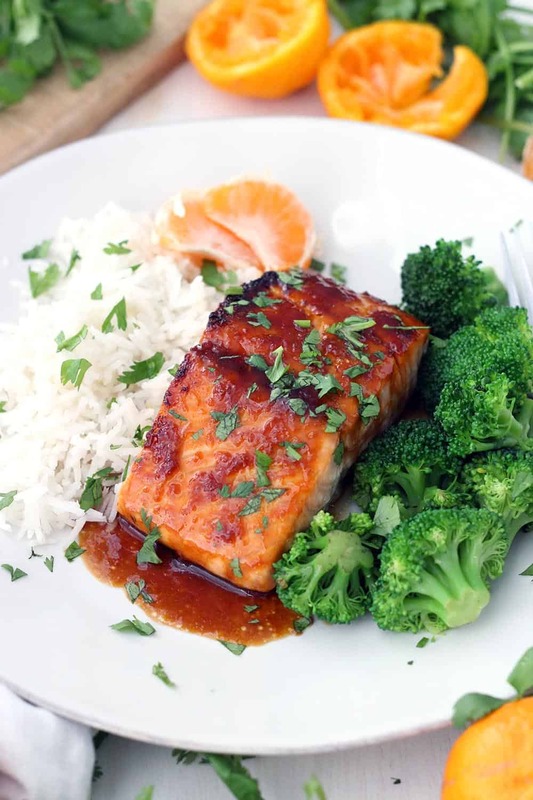 Here’s the recipe for Mandarin Orange Glazed Salmon! 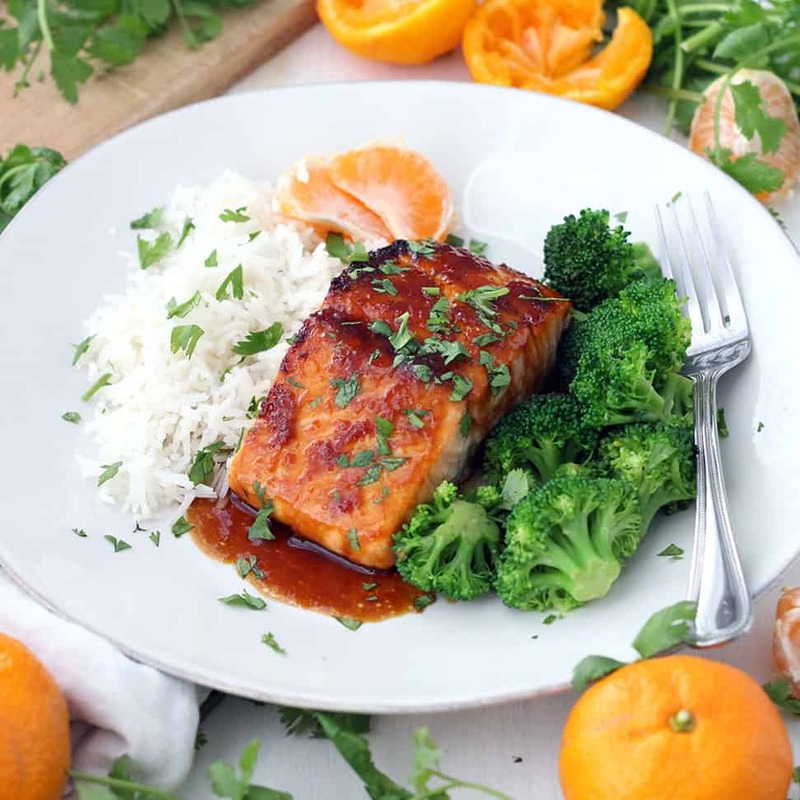 This colorful and healthy Mandarin Orange Glazed Salmon takes only 15 minutes to make and is broiled to perfection to create a sticky, thick glaze on top and keep the salmon moist and flaky. Season both sides of the salmon with kosher salt. OPTIONAL: for crispy salmon skin, sear skin-side down in a hot skillet with olive oil for 2-3 minutes, until browned and crispy, before proceeding. Place skin-side down on a rimmed baking sheet. Arrange top oven rack close to the broiler. Mix all remaining ingredients (besides cilantro) in a small pot. Heat on stove top, whisking constantly, until sugar has melted and sauce is slightly thickened (about 3-4 minutes). Brush some of the glaze on the top of the salmon. 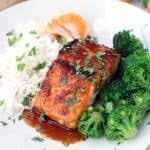 Broil salmon for 8-10 minutes, removing to brush more glaze on top every two minutes, until it flakes easily with a fork and glaze has developed a thick layer on top. Brown sugar creates a thick, sticky glaze, since it caramelizes well. Feel free to substitute it with a natural sweetener, such as honey or molasses, but be prepared for a thinner glaze on top. To make this gluten-free/grain-free compliant, be sure to use gluten-free soy sauce or liquid aminos. To make this paleo compliant, use honey instead of brown sugar and use liquid aminos instead of soy sauce. Thank you for sharing the recipe ive ask my wife to cook this later i cant wait to taste it. Its also good for our diet since all the ingredients are health friendly. I just tried this, and it was SO GOOD! Some of the best salmon I’ve had! Everyone loved it! Oh yay! So happy you liked it, and thanks for the comment!